Pole and Polar: Let S = 0 be a circle and P be a point. 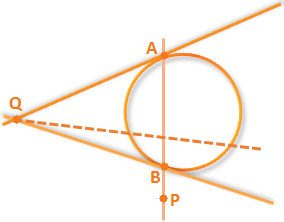 If any line drawn through the point P meets the circle in two points A and B then the point of intersection of the tangent drawn at A and B lie on a line called the polar of P with respect to the S = 0 and P is called the pole of the polar line. Proof: Let S ≡ x² + y² + 2gx + 2fy + c = 0 be the given circle let the chord (secant line) through P meets the circle in A and B. Let Q (x₂, y₂) be the point of intersection of the tangents drawn at A and B to the circle as show in figure. ⇒ If P lies inside the circle S = 0, then the polar of P does not meet the circle. ⇒ 6x + 2y – 11 = 0. This entry was posted in All, Mathematics. Bookmark the permalink.